Dr. Priyanka Shrawane is one of the best doctors in Nagpur, Maharashtra India. She is well experienced and trained Cosmetic and Dental surgeon in Nagpur & offers affordable dental treatment with quality services. 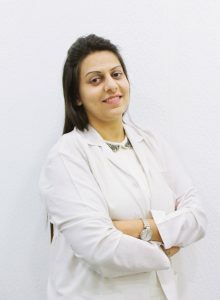 Dr. Priyanka Shrawane obtained her ‘Bachelor of Dental Surgery’ (BDS) degree from Maharashtra University of Health Sciences, Nashik from A.C.P.M. Dental College, Dhule, India 2006.She has worked as Practitioner from 2011 to 2014 in Pune. She is currently attached to navratra hospital and research centre since 2015. She is the recipient of several awards including Fellowship in Aesthetics Dentistry (F.A.D.) 2016, Germany. She completed her certification program from the Academy of Advanced Endodontist in December 2016.She also did the certification program from Pedo access, 2017. Dr. Priyanka Shrawane has completed her certification and hands on for fast track Endodontics on patients, 2017 at ETC finishing school. She has also done her certification program on basic life support in 2017. Dr. Priyanka Shrawane has attended the 3rd ICOI South Asia Implant Symposium conference in 2014, at Hyderabad. She has actively participated in nidacon 2016, 2017 convections and will also participate the upcoming 2018 event. She is the lifetime member of Indian Dental Association (IDA) under Dentist Act 1948 with registration number A-22331. Her dreams, determination, devotion and dedication resulted in the creation of ‘PS Dental Clinic’ Nagpur Maharashtra, India. Now she is providing her valuable Service at PS Dental Clinic Nagpur. Dr. Priyanka Shrawane has 6+ years of Experience.